Artist's concept of NASA's Grail mission. 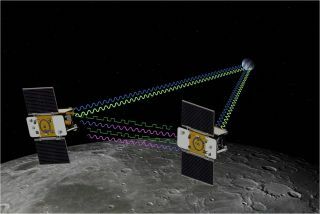 Grail's twin spacecraft are flying in tandem orbits around the moon to measure its gravity field in unprecedented detail. NASA's twin gravity-mapping moon probes received new names Tuesday (Jan. 17), reflecting their mission to study the changing pull of Earth's natural satellite. Now to be called "Ebb" and "Flow," the tandem Gravity Recovery And Interior Laboratory (or Grail) spacecraft arrived in lunar orbit over the New Year weekend and were previously referred to simply as "A" and "B". Their new names were offered by fourth grade students in Bozeman, Mont., who were chosen as the winners of NASA's naming contest. "The 28 students of Ms. Nina DiMauro's class at Emily Dickinson Elementary School have really hit the nail on the head," said Maria Zuber, who as principal investigator leads the Grail probes' mission from the Massachusetts Institute of Technology. "We were really impressed that the students drew their inspiration by researching Grail and its goal of measuring gravity." "Ebb and Flow truly capture the spirit and excitement of our mission," Zuber said. NASA announced the new names in a press conference Tuesday. The terms ebb and flow generally refer to the movement of water, especially in relation to Earth's natural tides that are influenced by the pull of the moon. The two words also describe the relative motion of the GRAIL probes, which will vary in distance with the moon's gravitational pull. "While we feel the ebb and flow of our tides, our twins will undergo nearly the same motion as they study our lunar neighbor," said Jim Green, who leads NASA's planetary science division in Washington, DC. According to NASA, about 900 classrooms with more than 11,000 students from 45 states — as well as Puerto Rico and the District of Columbia — suggested names. The contest was open to U.S. students in kindergarten through 12th grade and began about a month after the probes were launched last September and ran through Nov. 11. Zuber and former astronaut Sally Ride, the first American woman in space, selected served as the contest's judges. "With submissions from all over the United States and even some from abroad, there were a lot of great entries to look over," said Ride, who is now president and CEO of Sally Ride Science in San Diego. "This contest generated a great deal of excitement in classrooms across America, and along with it an opportunity to use that excitement to teach science." MoonKam, or Moon Knowledge Acquired by Middle school students, is NASA's first instrument to fly on a planetary mission fully-dedicated to education and public outreach. Managed by Sally Ride Science, MoonKam will provide thousands of fifth- to eighth-grade students the chance to select areas on the lunar surface to be photographed. MoonKam will start sending back images once Ebb and Flow begin science operations in March. Since the two probes entered lunar orbit two weeks ago, flight controllers have been refining each spacecraft's orbit to reduce the time they take to circle the moon to just under two hours. At the start of the science phase in two months, Ebb and Flow will be in a near-polar, near-circular orbit with an altitude of about 34 miles (55 kilometers). During their science mission, the washer-machine size spacecraft will transmit radio signals precisely defining the distance between them. As they fly over areas of greater and lesser gravity caused by visible features such as mountains and craters, as well as masses hidden beneath the lunar surface, the distance between Ebb and Flow will change slightly. Scientists will use this data to form a high-resolution map of the moon's gravitational field, providing them a better understanding of what is going on below the lunar surface. This information will increase knowledge of how Earth and its rocky neighbors in the inner solar system developed into the diverse worlds they are today. Continue reading at collectSPACE.com for the history behind students naming NASA spacecraft.